I first met Chugait Garmolgomut in the early ’80s, when I was International Student Coordinator for Ambassador College in Pasadena, California. Chugait was tall for a Thai, but was soft spoken, as is typical of Thai people. He told me he had been brought up in Chonburi, near Bangkok, but after his mother had married an American serviceman he came to live in the USA. When I met him, he was living with his step-grandparents in Arizona. He had been brought up in Buddhism, but after coming to understand Christianity he had converted. 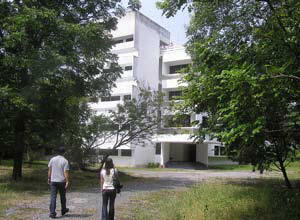 Ambassador College had several projects in Thailand, particularly among the Hill Tribe minorities in the North. I could see there would be a need for Thai speakers, so I encouraged Chugait to apply to the college. He was hesitant at first, but he eventually did. Chugait was intelligent and diligent and he did well in his studies, but he did not find the experience easy. The boisterous American college environment can be challenging for someone used to the more gentle rhythms of Thai culture. The idea of public speaking and vigorous competitive sports were especially intimidating. However, with much encouragement and support from the late Professor Herman Hoeh, who had a deep interest in all things Thai, Chugait made it to graduation. 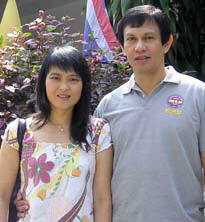 He then returned to Thailand with a dream of reaching his people with the gospel. Thailand is a deeply traditional society, where respect for one’s elders, the monarchy and the religion of the country are firmly entrenched. Or had been. Thailand was developing fast, people were prospering, and modernization was taking its toll on the traditional way of life. Young Thais were abandoning the old values and losing their sense of the sacred. Chugait wanted to help. He settled in Chiang Mai, Thailand’s second-largest city, and enrolled in some courses in Buddhist Studies at the University. He knew that if he was to be effective, he needed more education and experience. What he didn’t know was that he also needed Fong. Ahmphong — or Fong — was a young lady who was taking some of the same courses as Chugait. She was a committed Buddhist, and approached her studies with devotion. She was intrigued by this tall, quiet man who took copious notes on everything. One day she asked if she could see his notes on a lecture she had missed. Fong accepted Jesus Christ as her Savior and was baptized. The couple also fell in love and were married. Chugait now had a partner who shared his dream of reaching their people with the gospel. The young couple were not interested in starting yet another church. “What we needed was to develop a community of people who understand Christian values,” they said. Education was the vehicle that had brought them both to understanding the gospel. So they decided that education would be the tool they would use to reach others. They opened their first school in the basement of their home, with only 10 students. But word got around that the little school delivered a quality product at a fair price. Soon they were able to open another school. Then another, and another. 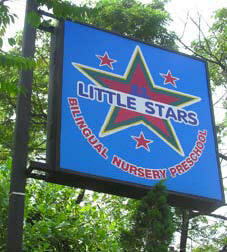 Today they have a network of ten schools in the north and north-east of Thailand, including a delightful nursery and kindergarten called Little Stars. Chugait and Fong’s story is a remarkable example of faith and vision. They have succeeded in planting a thriving Christian community where many others have failed. Right now the grounds are overgrown, and the building is vacant. But Chugait and Fong enthusiastically described their plans to have the empty rooms and halls filled with the sound of children learning, singing and playing. It is an ambitious project.